Caldera Track Proposal Gains Impetus - walking tracks and trails, (bushwalking, hiking, tramping, backpacking) Byron Bay - Gold Coast hinterland Australia. Northern Rivers Regional Tourism Infrastructure Fund, tourism projects. Rim Track unrivaled in Australia? by Larry Anthony, MP, Federal Member for Richmond, November 1997. Widely believed to have potential equal to the great walking tracks of the world, the Wollumbin Caldera region of Australia continues to suffer from lack of funding. Local Member of Parliament for Richmond, Larry Anthony, discusses the issues which need to be addressed if the vision is to become a reality. 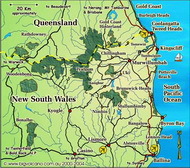 Nature based tourism and ecotourism are fast becoming the growth industries in the rural parts of the Mt Warning (Wollumbin) Caldera. More bed and breakfasts, lodges, cabins and wilderness retreats are appearing to service the growing demand. Over the years, walking tracks have been developed in virtually all of the National Parks of the region. Some have fallen into disuse. Others were not designed or constructed to modern standards. Still, thousands of visitors make use of the walking tracks in and around the Wollumbin Caldera every year. Now that visitation is growing, there is a real need to redevelop the many walking tracks and integrate them into continuous unbroken "wilderness trail". This has been referred to as the "Rim Walk" or "Caldera Trail". Many individuals and organisations have recognised this need and have put forward plans to fulfill it. Larry Anthony, Member of Federal Parliament for the Richmond electorate, which comprises about two thirds of the area of the Wollumbin (or Tweed, or Mt. Warning) Caldera, is an especially effective advocate. Larry is an enthusiastic hiker himself, recently somewhat limited by his responsibilities to his constituency. Here he outlines how he sees the situation and how the needs, though community co-operation, can be addressed. Hopefully, as a coalition government MP*, Larry will be able to ensure that some funding available through the Natural Heritage Trust (funded the partial sale of Telstra, Australia's major telecom company) will flow to the development of walking track infrastructure projects in our region. * Please note: Contact details in this story no longer apply. 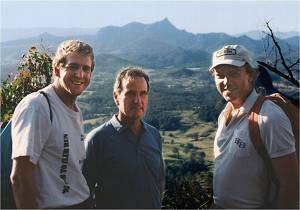 The idea of establishing a walking track around the entire rim of the Mt Warning Caldera is one that has been gaining impetus ever since bushwalkers first traversed this ancient and magnificent landscape. As a keen walker myself, it is also a project that holds particular interest for me. I believe such a track would rival internationally renown walking tracks such as the Milford Track in New Zealand, the Overland Track in Tasmania, the Appalachian trail in North America and the Pennine Way in England. Significantly, a complete track around the Caldera would take walkers through five existing National Parks - Springbrook NP, Lamington NP, Border Ranges NP, Nightcap NP and Mount Warning NP - all World Heritage listed. The unique geological, historical, biological and aboriginal heritage of the area, not to mention the extraordinary and dramatic scenery, would be unrivaled anywhere in Australia and would attract people from all over the world. Naturally there would be a significant benefit to the local eco-tourism industry which has growing potential in the Tweed Valley. With such an outstanding walking track in the area, I envisage the Tweed becoming a magnet to bushwalkers, nature lovers and flora and fauna enthusiasts (just as the neighbouring Gold Coast offers the more superficial attractions of theme parks, shopping and casinos). Such a track and many walkers each year will have a considerable impact on the landscape and habitat, and also on the flora and fauna. A great number of issues need to be considered, not least of all how to finance such a project, but also importantly the type of track, the type and amount of use the area could accommodate, how it would link with existing tracks and facilities, track and facility maintenance, the degree of supervision of users, and other issues. Naturally in some especially sensitive areas, track access would need to be limited. I envisage a number of access points, allowing a wide range of use, from short half hour circuit walks, whole day treks, and longer overnight journeys. Walkers need to be able to get on and off at various points. I envisage the whole track could start at Currumbin/Tomewin, moving through to the Cougals, Lamington National Park, Border Ranges, Nightcap and through to the mountain ranges at the back of Mullumbimby. The total walk could well take up to two weeks - for the very keen only! There are a great many people with expertise in different aspects of such a track, including environmental, human needs and impacts and commercial aspects. I am keen to ensure that everyone with experience or expertise to offer, is able to have some input into this proposal - both to ensure the preservation of the area, and to draw on a vast local knowledge base. The potential for nature-based tourism and eco-tourism in the immediate area and wider afield would be greatly enhanced by the construction of this track. We already have thousands of people visiting the area to enjoy its natural beauty, from which a solid eco-tourism industry is emerging. This will be enhanced with the completion of the World Heritage Rainforest Centre at Murwillumbah. The Caldera Track would be the jewel in the crown of this sunrise industry and would create much-needed job opportunities, multiplying through farm stays, accommodation, retailing and other service industries in the region. A preliminary meeting has determined to seek funding for a feasibility study. If this is successful, expect to hear more about this proposal in the media and through my own newsletter. In the mean time...happy walking! I will be walking another section of the proposed Caldera trail during the cooler months of 1998. Call my office if you would like to join me - first in best dressed! Phone 07 5524 2466*. Caldera Track Proposal Gains Impetus, by Larry Anthony, MP, Federal Member for Richmond, November 1997. Photos: "Overlooking Mt. Warning from Nightcap National Park", © Larry Anthony.